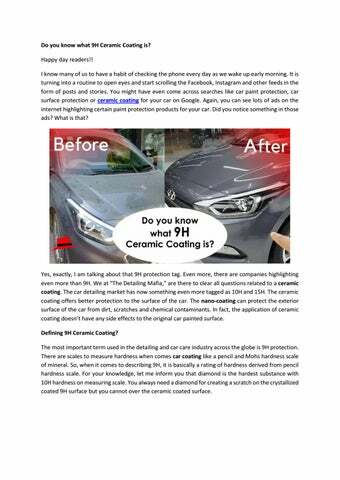 Do you know what 9H Ceramic Coating is? Happy day readers!! I know many of us to have a habit of checking the phone every day as we wake up early morning. It is turning into a routine to open eyes and start scrolling the Facebook, Instagram and other feeds in the form of posts and stories. You might have even come across searches like car paint protection, car surface protection or ceramic coating for your car on Google. Again, you can see lots of ads on the internet highlighting certain paint protection products for your car. Did you notice something in those ads? What is that? Yes, exactly, I am talking about that 9H protection tag. Even more, there are companies highlighting even more than 9H. We at â&#x20AC;&#x153;The Detailing Mafia,â&#x20AC;? are there to clear all questions related to a ceramic coating. The car detailing market has now something even more tagged as 10H and 15H. The ceramic coating offers better protection to the surface of the car. The nano-coating can protect the exterior surface of the car from dirt, scratches and chemical contaminants. In fact, the application of ceramic coating doesnâ&#x20AC;&#x2122;t have any side effects to the original car painted surface. Defining 9H Ceramic Coating? The most important term used in the detailing and car care industry across the globe is 9H protection. There are scales to measure hardness when comes car coating like a pencil and Mohs hardness scale of mineral. So, when it comes to describing 9H, it is basically a rating of hardness derived from pencil hardness scale. For your knowledge, let me inform you that diamond is the hardest substance with 10H hardness on measuring scale. You always need a diamond for creating a scratch on the crystallized coated 9H surface but you cannot over the ceramic coated surface. When it comes to ceramic coating, why hardness matters? Well, the best way to explain ceramic coating is considering ceramic coating as the 2nd layer of your skin. This 2nd layer is nothing but just to add a layer of protection. It is just like a tempered glass packed as in a liquid. The more is the thickness of the coating; the more is the protection added to your car. The Optic coat brand ceramic coating is best when it comes to adding a protective layer to the car. In fact, it is the best 9H car coating in terms of demand and result across the globe. We deal with minimum 3 to 5 car per day when it comes to the professional application of Opti Coat. Ceramic coating is defined as a liquid polymer which is professionally applied to the exterior surface of the car. It has many major properties like self-healing, hydrophobic in nature, scratch, mar and chemical resistance along with protecting the car from the harm caused by the UV rays like fading of car colour. In short, if you need a base to trust this car coating, it is the best car care product as it adds ageless protection to the car painted surface. Opti Coat is always a step ahead in terms of giving protection to the car and using advanced technology. Ceramic coating is the perfect need for your car care. The 9H feature of Opti Coat Pro: It is a permanent nano-ceramic coating which features a highly defined, unbeatable hydrophobic capacity, chemical resistance, thermal and UV rayâ&#x20AC;&#x2122;s resistance and many others. 9H car coating forms a permanent bond with the topmost layer of car paint along with providing an unwastable layer of hard protection. You know what, you have to put an extra effort to remove the ceramic coating from the car surface like using abrasive material. This proves that this in reality ceramic coating is the best choice any car owner can actually gift to their car. The unique formulation of the 9H ceramic coating has enabled a multi-layered that means the coatingâ&#x20AC;&#x2122;s thickness can be increased with adding layers permitting a harder film which will enhance its resistance capacity of scratches or mar. After reading this, I hope you have a clear idea about 9H and its relation with ceramic coating. Anything above 9H hardness of ceramic coating does exist: When it comes to deciding hardness of ceramic coating till date 9H was ruling the detailing market, but there are detailers who are making a point of having something higher than the scale of 9H. This is actually the wrong propaganda presented to customers as anything else can cause harm to their vehicle. In layman’s language, anything hard than 9H is considered very thick that can abrupt your car’s external surface. Due to its hardness, anything greater than 9H loses its elasticity. So, when the original elasticity is lost, the car painted surface tends to crack down if any sort of external pressure is given. For example, if your car gets any sort of damage, the complete car paint gets cracked. So, the Detailing Mafia warns you against any marketing spam showing 10H ceramic coating or even more. Always believe in ceramic car coating mentioned as 9H and trust me Opti coat give your car the best protection. Summary: It took years for experts to embrace the benefits of the nanotechnology and give it a tag of providing premium car service for protection. Opti coat, ceramic coating ranges are properly tested and certified for the excellence and this lay base for customers. In the end, in the concluding line, you should remember one thing- once you select the ceramic coating service always choose professionals. At “The Detailing Mafia,” we feel pride that it is a one-stop destination for all your car care needs like ceramic coating, paint protection film and other. We hold specialization in applying ceramic coating along with other services which ensure that the car is completely protected, safe and sound. If you are thinking to get your car wrapped with ceramic coating, opt Opti Coat as they are the best-suited product for your car. 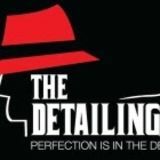 Check out the services of The Detailing Mafia, and contact us at 80-100-44000 or visit our website http://www.thedetailingmafia.com/ to book your slot.